Οι After Dark μας έρχονται από την Αγγλία. Δραστηριοποιήθηκαν στο πρώτο μισό της δεκαετίας του ογδόντα καταφέρνοντας να κυκλοφορήσουν δύο singles. Υπήρξε κι ένα τρίτο ηχογραφημένο, αλλά η μπάντα αποφάσισε να μην το κυκλοφορήσει. Το 1983 οι After Dark βρήκαν δισκογραφικό συμβόλαιο και ηχογράφησαν το full length album "Masked by Midnight", το οποίο τελικά δεν κυκλοφόρησε λόγω οικονομικών προβλημάτων και "βγήκε" το 1995, αρκετά χρόνια μετά την διάλυση του Βρετανικού συγκροτήματος. Album: "Masked By Midnight (The Anthology)"
Δελτίο τύπου: «After Dark was put together in Woodley Berkshire in England in 1980. It was in 1981 that the band recorded the classic single "Evil Woman" which enjoyed a lot of success mainly through lots of airplay on Tommy Vance’s Radio 1 rock show, and also via its distribution by Pinnacle Records. The follow up single, a double A side "Rock & Roller" c/w "Too Late" was recorded later in the same year, but was never released because the band were never happy with it. The band gigged extensively, doing lots of support slots to big acts of the time, like Y&T, Trust and Samson. In 1983 After Dark were picked up by a record and management company called Lazer and were soon recording a debut album in Jigsaw Studios in Surrey with producer Dave Williams. The band were then asked to do a support tour with Diamond Head. As the album was still being recorded, Lazer decided to put out a promotional picture disc with 2 tracks from the forthcoming album "Masked By Midnight". These tracks were the now legendary "Deathbringer" with "Call Of The Wild" on the B side. The tour was a great success for the band, and the picture single sold very well. But with the tour and finishing the album costing so much money, it was decided that the album could not be released, which was a big mistake and a disappointment at the time. 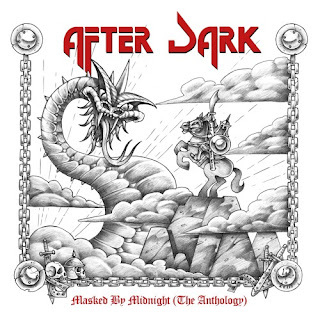 However After Dark continued to gig and carried on for another 2 years before it was decided that a split was inevitable. The album was finally released more than a decade later, in 1996, and was available as a limited edition pressing... We're now 22 years later, and once again, Skol Records is bringing the forgotten NWOBHM jewels back to light.